SKY Perfect JSAT Corporation (Head Office: Minato-ku, Tokyo; President & CEO: Masanori Akiyama) hereby announces the successful launch of the JCSAT-12 communications satellite. 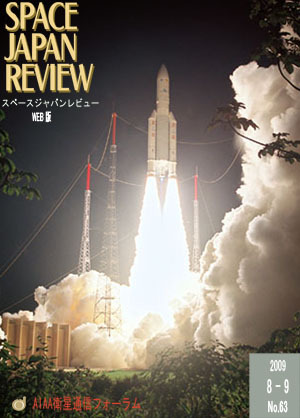 JCSAT-12 was launched from an Arianespace Ariane5 launch vehicle at the Guiana Space Centre, French Guiana, South America at 7:09 a.m. on August 22, 2009 Japan Standard Time. The satellite separated from its launch vehicle at 7:35 a.m., and a signal was received normally at 8:07 a.m.
"Since I was a girl, my yearning is Space. And since certain point I started to think seriously to become a person who works with Space. One day when I was a senior year high school student, an advertising catalog was in my post. This changed my entire life." Ms. Mizuho Aoyagi, who is working at the Yokohama Satellite Control Center (YSCC) of Sky Perfect JSAT Corp. as one of three female engineers, talked about her experiences and efforts of embarking on her career as a satellite engineer. "The civil protection warning system" (J-ALERT) which notifies large-scale disasters, armed attack information and so on was constructed and the operation has started. J-ALERT delivers emergency information to the people via satellite; such as a huge earthquake will be observed or the announcement of evacuation will be issued. This system is expected to reduce the disaster victims and to prevent the further disasters. The overview of J-ALERT, a process of development and examples are described. We report the experiment of collaborative remote lectures with the WINDS/Kizuna satellite held last year. In the experiment, three universities: University of Tsukuba, Asia Institute of Technology in Thai, and Multimedia University in Malaysia, were connected by the satellite. We can utilize the on-satellite switching function and connect these multiple sites directly with one-hop. We have proved multi-site real-time e-learning in Asia is feasible with WINDS.